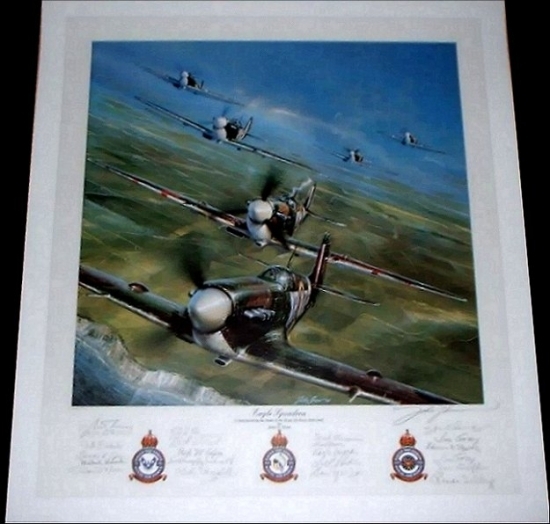 Overall Print Size: 28 1/4" x 30 1/2"
A stunning salute to the pilots of the Eagle Squadrons and their beloved Spitfires as they head out over the channel and the white cliffs of Dover. One of the remarkable chapters in the history of aviation concerns the American Airmen who fought against the Luftwaffe during the early days of World War II in number 71, 121, and 133 Squadrons of the Royal Air Force Fighter Command, The Eagle Squadron. The Eagle Squadrons formed an extremely unusual group. In fact, only once before had such an "organization" been put together and that was made up of Americans who volunteered to go to France and fly in the Lafayette Escadrille. The Eagle Squadrons were made up of American pilots who wanted so badly to fly and fight in World War II that they couldn't wait for the rather uncertain entry of their country into the conflict. They went to England and joined the Royal Air Force. They ranged in age from a boy of 14, who had to bluff his way in, t the oldest, who was called the elder statesman of the group at 38. Most of these young men had very little flying time and practically none of them had flying time in anything with large engines or resembling the Hurricanes and Spitfires which they flew for the RAF. The pay wasn't worth talking about but the men wanted to help wage war against Hitler.